A few important questions should be asked before applying animal manure/effluent to a growing crop. Photo credit Larry Howard. 1. Under the wrong circumstances, animal manure/effluent applied to growing crops can damage plant tissue and impact yields. However, good alternatives do exist during the growing season. 2. Under some unique circumstances, the salts in manure/effluent can impact soil salinity. But these circumstances are not common and can be avoided. 3. A few important questions should be asked before applying animal manure/effluent to a growing crop. • Knowledge of manure’s salt concentration (or electrical conductivity) is essential. Measuring manure/effluent EC with a low cost electrical conductivity meter (or laboratory test) is essential prior to application. Retired UNL faculty member, Charles Shapiro, observed that liquid manures with an EC greater than 6 dS/m should not be applied during early vegetative growth for soybeans (Shapiro, 2005). EC below 12 dS/m were tolerated when applied at flowering. The Colorado State research sited above use swine lagoon effluent ranging from 4 to 5 dS/m on corn without concerns. • Shapiro observed that corn was more tolerant than soybean with damage in corn only observed for an EC of 20 dS/m. Another researcher suggested that plant tissue susceptibility to injury varied (least to greatest) with sugar beets < cotton < barley = sorghum < alfalfa < potato. • Plants at a later stage of growth are “less” susceptible to tissue damage from salts. As shared above, soybeans tolerate animal manures at flowering stage much better than in early vegetative stage. Shapiro observed that in corn, application at V8 with higher strength manure (20 dS/m) caused some yield loss. Corn leaf damage was observed when applied at V14 stage but yield responded positively. • Research has generally suggested that hot, dry, windy conditions producing high evapotranspiration rates increase the risk of plant tissue damage from manure irrigation. Plants can also be damaged due to increases in soil salinity. Of greatest concern is a sudden increase in soil salinity that may occur in sandy soils with low buffering capacity when soil water in the root zone is depleted. If these conditions exist, manure application should be avoided. In most Midwest conditions, saline soils are uncommon as sufficient rainfall occurs to flush accumulated salts from the root zone. Monitoring soil salinity during regular soil testing is a good check for potential concerns that might develop in low spots, areas with poor drainage, or from frequent repeated applications. Excellent information on managing soil salinity and crop tolerances is shared by a Colorado State Extension publication (Cardon, 2007). • What is the electrical conductivity of the manure/effluent being used? Manure/effluent with an EC of 6 dS/m or less should protect soybeans while values of 12 dS/m or less should be acceptable for corn. • If manure/effluent EC is higher than recommended, is fresh water available for dilution? • Can application be delayed or applied on a more mature crop? The leaves on more mature plants are less permeable to salt absorption. • Is there access to a hay crop that has been recently harvested with modest leaf growth to be damaged? Application to a recently harvested hay crop may be a preferred option. • Can manure/effluent be applied at a time when evapotranspiration is lower? Evapotranspiration and risk of tissue damage is greatest during hot, dry, windy conditions. Application during evening or early morning should be more favorable. • If applying to a sensitive crop or stage of growth, could manure/effluent application be quickly followed with a clean water rinse for the crop? Removing salts from leaf surfaces can minimize or prevent damage? • Is there water storage in the soil profile to infiltrate the applied effluent and avoid surface runoff? 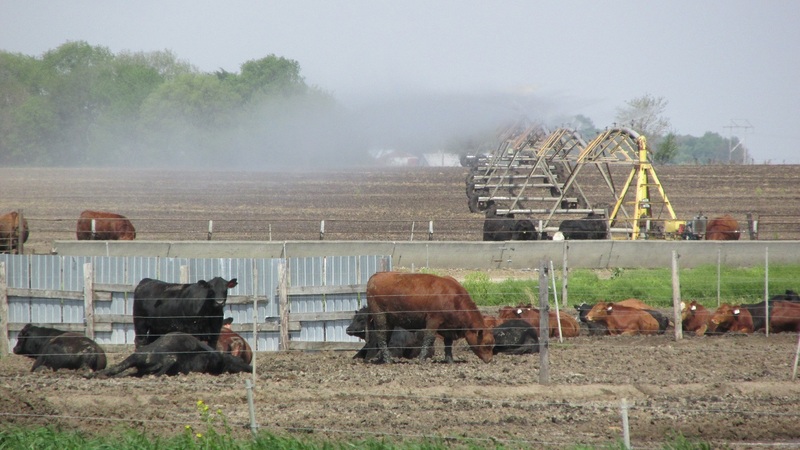 Manures and runoff from feedlots are valuable nutrient resources for applying on growing crops. Asking a few important questions about risks of salt damage to plant tissue can protect crops while maintaining animal manures as a positive crop resource. For more information on irrigating with effluent, refer to EC778, Application of Liquid Animal Manures Using Center Pivot Irrigation Systems. 1. M.M. Al-Kaisi and R.M. Waskom. 2002. Utilizing swine effluent for sprinkler irrigated corn production. Journal of Soil and Water Conservation. 2. C. A. Shapiro, W. L. Kranz, C. S. Wortmann. 2005. Salt thresholds for liquid manure applied to corn and soybean. 3. G.E. Cardon, J.G. Davis, T.A. Bauder, and R.M. Waskom. 2007. Managing Saline Soils. Colorado State University Extension.